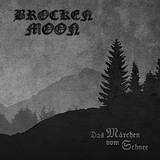 On Das Marchen Vom Schnee, their second full-length, German black metal duo Brocken Moon, Grim and Humanhater, raise and successfully resolve a number of internal controversies. For starters, having put together a 50 min black metal concept, Brocken Moon do not even name their compositions, instead simply preferring to give them Roman numerals. How bold is that?! The album begins and ends most unexpectedly as well. Without much intro or adieu the band plunges into I, beautiful romantic piece of music, where melody flows so abundantly you don’t want it to end, ever. Drums bombastically blast their way around, cymbals crush, but melody survives and perseveres. III proceeds very much in the same vein, and where rhythmically things do seem alike (rhythm section on the album is simply to provide cadence), melodic splendor puts both of these tracks over the top. Add woven in acoustics, multiple guitar lines joining in, and you can see why I and III have been frequent guests in my player. As atmospheric and “journey through the woods” as I and III sound, IV is so much rawer, thrashier and nastier, it may have come from another band, but here it showcases the breadth of Brocken Moon feelings. If II is all peaceful, birds chirping, the end of V spells disaster, the riffs turning icy, the track could be no less monumental. And then there are Grim’s vocals. So many shades in the span of one album. Gothic introverted voice on III, whispers on II, distorted a la Celestia and Xasthur, but not disgustingly, black metal shrieks on I next to the clean choral moments. Then IV and V give us a glimpse of how serene, nonviolent forest creature can turn Pan-satyr mad. From dog howling to rooster cries to complete cuckoo, these are the sounds of nature in their entire crazy whole. The end is no less perplexing. VI is a 20 min long acoustic song, which does not progress much beyond the first half-riff of Beethoven’s Moonlight Sonata. I would not want to pile on top of what probably many already said about such conclusion to the story, but a shorter similar ending could have made for a lot more efficient EP. To finish with controversies, the band itself was rumored to have connections to the German NSBM scene, but given this release appears on Northern Silence, the label which prides itself on avoiding those associations, that rumor is most likely what it is, simply a rumor. If you enjoyed Northern Silence taste with many of its other atmospheric melodic yet not modern neutered signings (Draugsang, Nasheim) you will see why the label snapped Das Marchen Vom Schnee the minute it came out.